Usually when you see a product from a company, you don’t get a whole lot of background on where it came from or how it was created. Great products don’t need an explanation, they just work and people love it. Products that are better than great require a backstory, because it’s so interesting that you want to know as much as possible about it. Apple makes products that just beg for the full story. How did Steve Jobs decide to make the iPhone? What is the history of the iPad? Google has been spitting out interesting products as of late, one of them being the Knowledge Graph. The feature allows you to drill down to find more information about people, places, and things that are relevant to what you’re searching for. Knowledge Graph made me want to hear more about its history, so I had the chance to speak with the product manager at Google that led its launch, Emily Moxley. As you’ll learn, she started pushing the technology envelope at an early age. TNW: Before Google, what got you passionate about technology? Emily Moxley: Growing up I was always into math and computers, I had a computer starting in 2nd grade, but what actually really got me into technology was a gift I received on my 16th birthday. 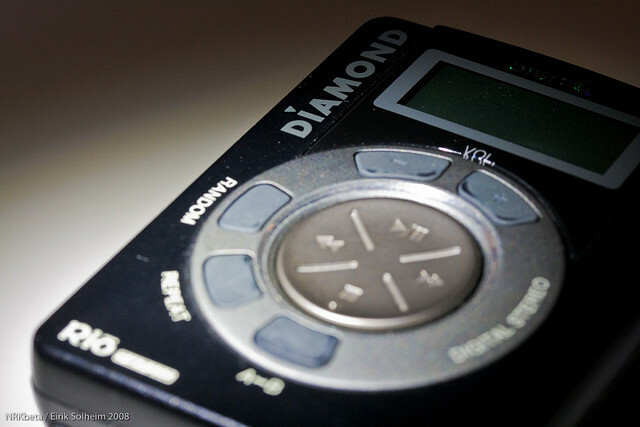 I got the Diamond Rio MP3 player, one of the first on the market. It had 32MB of storage and was tiny. I started looking into how a CD was encoded into an MP3, I learned about signal compression. I went into engineering at Princeton and did a PHD at Santa Barbra in computer vision. TNW: What is your background at Google? What projects and products have you worked on before Knowledge Graph? Emily Moxley: I started off working on search UI, I worked on a number of small tweaks on the search page. Alignments, different elements and expiments on user experience. Last summer I worked on the redesign of the search page, and we also changed the structure of the result block. This is all rooted in my understanding of how small changes can impact user behavior and in a way that not too many people do. TNW: How did you use your learnings from Google along with your passions to fuel the Knowledge Graph product? Emily Moxley: First, my general UI experience helped me understand how to surface this information from the knowledge graph in a useful way that wouldn’t get in the way of every day usage. We say internally “don’t break search”. Search is a huge part of everyone’s lives, and we wanted to make it a better experience. That UI experience helped me figure out what the search page would look like. I like learning things, I like exploring things. We had 26 volumes of the world book Enclyopedia when I was young. I spent a lot of time pulling out these different volumes and looking up things that I heard at school or that people were talking about. I’m always on the search for new things to try. I used to be known for asking my friends to give me their favorite book on my birthday each year. One of the features in the Knowledge Graph is “people also searched for” at the bottom of the panel. If you’ve searched for something, you can see what other people also found to be interesting. My PHD in computer vision involved getting images and videos on computers and getting users to “see”. TNW: How long did you work on Knowledge Graph before it was announced? Emily Moxley: I had been working on the Knowledge Graph for about a year, but there have been a number of related things worked on in the past at Google. This is actually the first UI that showed a lot of that information prominently and on so many queries. TNW: Can you tell our readers what you see Knowledge Graph accomplishing in a way that our moms can understand? Emily Moxley: We’re trying to do three things: one is to allow users to unambiguously express what they’re looking for. If you’re an avid sports fan from Philadelphia, and you search for “eagles” you probably mean the team. If not, you might be looking for information about the band and their latest tour. We really want users to be able to fully express what they want before we show results. Another thing is allowing users to dive deep into a summary of an interest that they have. The other day I did the query of Shakespeare and saw a selection of information about him. One of the interesting things that I noticed was he had one child named Hamnet. Also, we want people to be able to explore broadly around a topic. TNW: Which teams at Google do you interact with the most, and how do you manage all of the ideas and feedback that you get internally? Emily Moxley: There were a number of different little projects related to this feature that we had to nail before the launch of the product. There was a team working on just data, then we had to figure out how to reconcile the data points that we’re already pulling in. There was a team on ranking the information. The entire company then went through a “dog food period” where we got an overwhelming number of feedback and suggestions. People were very excited. We did a good job of incorporating that feedback and we’ll continue to iterate on it. TNW: How do you weigh customer feedback at Google when considering what direction a product goes? Emily Moxley: We get feedback internally and externally through a number of different ways. We’ve asked people to report incorrect data and we also get a fair amount of forum activity about features. Popular requests tend to naturally cluster together. TNW: What other products at Google get you excited? Emily Moxley: I absolutely love Chrome, it’s amazingly fast and there are huge opportunities around Chrome to fetch the information that you’ll want next. The second thing is Google Music. On Tuesday I broke my MP3 player of seven years, but Google Music had all of my music on the cloud and let me play it through my phone. These are the types of conversations that keeps my passion about technology alive. It also makes me feel like we haven’t even scratched the surface on what we can accomplish yet. Thanks to brilliant folks like Emily Moxley and the rest of the talent at Google, we can find information quicker than we ever have before. Can you imagine having to still pull out an Encyclopedia volume to figure out something that’s been bugging you, or something that you’d like to learn more about? Didn’t think so. I’m pretty glad that Emily got that MP3 player for her 16th birthday.